So this is week seven of the group therapy program I’m attending as a psychiatric outpatient. Part of the process involves guided journaling. 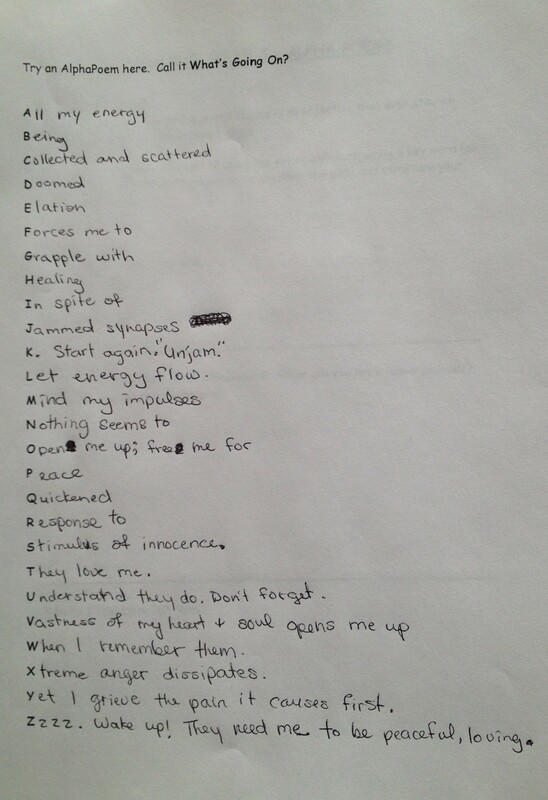 Last week’s was an exercise called Alpha Poetry. There aren’t many rules, as it’s a means of getting your mind to open up as you journal. Basically, for each letter of the alphabet, begin a poem with a word for that letter. Continue through the alphabet. You’ll see what I mean when you read mine, below. I like to do my journals fairly quickly, so that I don’t over think and over edit. What comes out is a raw bit of truth about yourself in that moment. I arrived at my program after dropping the girls off at their school. Drives to school can be very tough. A lot of emotion flares up as we journey across the city to the part of town where their father lives, and where they go to school. Everyone experiences anger at some point during the week. There is arguing, screaming, threats of lost privileges, defiance, crying, pleading, silent treatment – you name it. Then there are my children’s emotions. Other days, there is, I must tell you, laughter, joking, sharing, storytelling, chatting, exploring ideas, word games, listening to music, watching movies. I love those times with my girls. It gives me hope and strength. Hopefully they will remember those times as well. They are also truths about me. What I fear they will remember exclusively are the days when I don’t handle things so well. The days I lose my temper and slip into the kind of behaviours they might talk about some day (if not already) with their friends, sweethearts, family, perhaps even therapists. Or worse, these are the days they might hold inside and not grapple with. These are the behaviours mothers dread. Let our girls play with Barbies. Force them into exclusively traditional gendered roles of any kind. (not a tall order at all). Allow them violent toys of any kind – even water guns. Spank, threaten to spank, wish that we could spank, talk about the spankings we got when we were kids. Let them watch stupid cartoons or kids shows that reinforce negative gender roles and inspire “bad” behaviour (whatever that means to us). Scream at them, shame them, make them scared or sad or any less than the amazing people they are. The list is actually quite extensive, but this is the gist (might be fun one post to make a list of the top 20 promises I made to myself – or spouted from a pre-parenting soap box). Motherhood seems to consist in The List’s slow, dramatic, sometimes painful revision. There is humour too. But it’s easier to forget the humour when we really think we’ve failed. My worst hypocrisy is the last one listed. This day in particular was a moment of grief and shame for my behaviour and anxiety about the impact a mother can have on these beautiful, amazing people (with the tempers and the arguments and the defiance that are part of growing up). A page from my journal – a note about my girls. Peaceful. I don’t mean the false quiet that is the muffled scream of stuffed emotions. No. I want my rowdy wonderful kids to stay rowdy, passionate, strong-willed, sure of their voice. But I want our go-to reactions to be peaceful. We will be stressed. We will feel our emotions. All of them. What I wish for is the kind of peace that tempers the emotions we all feel sometimes. I imagine it would create kindness as the go-to reaction to each other in our struggling little family. It all has to come from me. Another tall order. For this, I would especially appreciate your comments. The link is at the top of the post. What are the points on your lists? Revisions? Tell me a funny story if you like; I could use a funny story today! Don’t be shy! ← WWMPD: What Would Mary Poppins Do? Was Rui a Bad Dog who would grow up to be a sheep-killer, or worse? And that was the lesser of the problems. The bigger problem was my response. I became furious, yelling at him to stop, angrily dragging him to the pole while screaming in fury, “If you do that again, I’ll kill you, you little fucker!” A young puppy can be excused for his poor behaviour; he’s learning how the world works, and trying out different strategies. But an adult male in his late 50s? Should be more self-control there, I thought. Except that it wasn’t about self-control of course, it was about where the anger came from, and why. If I weren’t angry, I wouldn’t need self-control. I knew that I had always gotten angriest when I’d felt I wasn’t being seen, when I felt as though I was being ignored. That anger had never proved terribly helpful when dealing with school administration, or misbehaving students, so why would it be with a three month old puppy? Hypothesis: the problem isn’t that you’re not perfect, but that you expect yourself to be. I just wanted to say that I could relate to this. I love this line: “There is arguing, screaming, threats of lost privileges, defiance, crying, pleading, silent treatment – you name it. Then there are my children’s emotions.” Yup… 🙂 I also love uhclem48’s comment. There’s great wisdom in that. Sometimes the key to improving things is just accepting what you’ve got to deal with and finding ways to work within your (collective) limitations.